Processions 2018: Representing 131 years of T&T Women’s Talents! We had an amazing time at the #processions march on Sunday! Thanks to all the groups who creatively added to our banner, & to the trustees & friends who joined us on the march. It was a privilege to celebrate both 100 years since the first women’s vote and the visionary women who set up T&T back in 1887! Lovely to meet so many great women & other community groups along the way too! Volunteers included Truly Johnston and Wei Lei, our amazing trustees, as well as fabulous T&T staff Jemma and Rochelle, and good friend and collaborator Annabel from Sands Film Studios and Bron from Community Southwark. A big shout out to Trevor, a dedicated member of the Green Team, who helped us transport the huge banner to the procession, and of course to the many many people at T&T who contributed to this banner: the Happy Mondays, Tiny Talents, Create Space, Crafty Beasts, Rainbow Arts & Crafts, Adults with Autism and many many more! Our resolution for this year: more celebration of our progressive history, more celebration of our amazing feminist heritage, and more promoting the kind of progressive vision of the future that spurred us on at the start. One of our friends from Rainbow Arts brought in this photograph of the 1940s. Does anyone recognise it? To the far right, with a play park on top (notice the railings to stop the ball going over the side – or the kids!) is one of T&T’s former buildings. Back then, T&T owned several buildings – these days, we don’t own any, but are very happy to be in our beautiful Old Mortuary which we rent from Southwark Council. Do you have any memories of playing at those old buildings? Tell us more! A big T&T welcome to Sasha, who has just started as our new Programme Assistant. As you can see, she is already showing off her talents! She’s putting the finishing touches to the banner created by all the fabulous women in various groups at T&T ready for the Procession 2018, celebrating 100 years of women’s right to vote. As an organisation set up by visionary women in 1887 – who were ardent supporters of women’s rights, and their amazing talents – we’re very proud to be taking part. We’ll post again with some pictures from the procession on Sunday. Meanwhile: congratulations and more power to everyone taking part! Our Director, Alex Evans, recently wrote a blog entry for NHS research charity King’s Health Partners about our Green Team. Interested? Come along any Tuesday or Friday! Alex Evans, Director of Time & Talents, a local charity which is increasing mental and physical wellbeing in the community, blogs about how gardening and outdoor activities can have a positive impact on our wellbeing. Come round the corner from the Rotherhithe roundabout, and it’s like being in a different world. Surrounded by housing estates, and some of the most deprived areas in the UK, Time & Talents (T&T) is based in an old mortuary (yes, an old mortuary) built in 1868 – which is much nicer than it sounds. 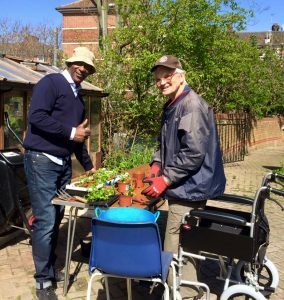 Surrounded by beautiful mature gardens, on the edge of a picture postcard square which looks like it comes out of Downton Abbey, and yet encircled by traditional social housing, our Green Team gardening club meets twice a week. Every session sees up to 15 people coming together, from their 20s to their 80s, a mixture of men and women, with different accents and origins. At first glance they seem to have nothing in common. That changes when the gardening starts – or, some would say, when the kettle goes on. A year ago today, the London Bridge attacks a mile down the road horrified us all. The day after, we said all we could do was keep doing what we do: strive to build a world where everyone feels part of a community. Today, our Big Lunch, where we welcomed friends from across that community as well as new friends from Eden Project and Big Lottery Fund carried on that work. We’re sending out a huge thank you to all our volunteers, and love, fun and friendship to all. More than ever, we believe in fun, friendship and mutual support. Join us at T&T and help us make it happen. 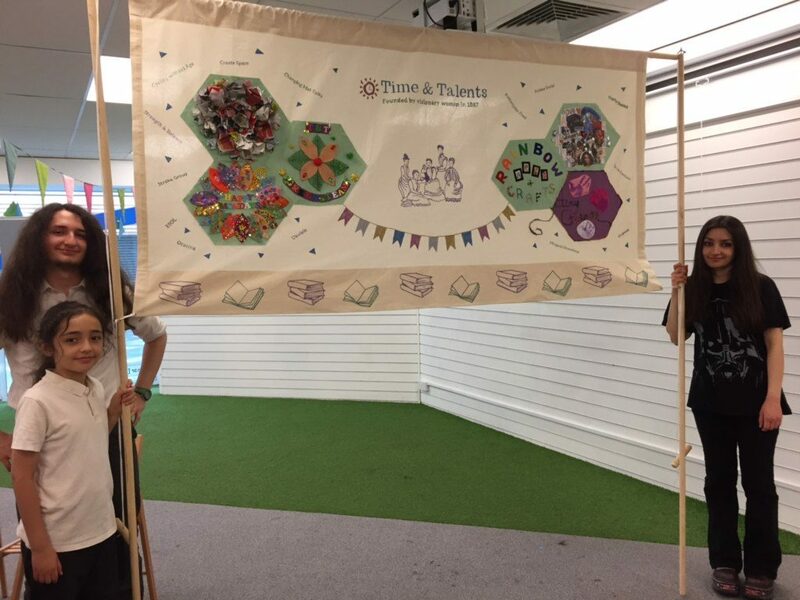 Well over 100 local people of all ages came to our Spring Open 2018, to see a showcase of T&T activities – some run by us, many run by talented, creative local people at our venues. A great chance not just to find out what everyone else does, but also to do the most import thing of all: mingle, buid new friendships, and create opportunities for mutual support. What an absolutely stonking do! Thanks to everyone who came for fun, music, and to share some pizza and friendship under the wisteria!! Congratulations to the many speakers who talked about the great things they do, including the amazing Breath of Life choir, and ukulele orchestra – and also shout out to Alyson on her first, very successful, pizza making session! See you all in a couple of months for our annual TROPICAL PARADISE party! Who’s ready for Create Space today? WE ARE! Perfect for mental health awareness week. A great way to de-stress and do something fun together! #mentalhealth This fantastic group is proud to be supported by Guys and St Thomas’ Charity and Quay Health Solutions. And that’s all you’ll hear about health – get your flippin’ knitting out! Big shout out to the amazing Tammy, the volunteer who is putting this together. You are AMAZING! Fantastic Crafty Beasts session with our Stroke Club and lovely students from Alfred Salter Primary School doing some fruity printing!   We’re very grateful for support from the Open Societies Foundation for this work!